Our Golden Triangle Safari featuring South Africa & Victoria Falls links Cape Town’s waterfront beauty with Sun City’s The Palace of the Lost City, nestled in an extinct volcanic crater, surrounded by a Big 5 nature reserve. And to top it off, 2 nights in a luxury resort, set against the heart-stopping backdrop of beloved Victoria Falls. Touch down in glorious Cape Town to begin this adventure-of-a-lifetime. Explore her peninsula, at the Cape of Good Hope – with its quaint fishing villages, colonies of barking seals and a most improbable collection of arctic penguins. Aerial View of Cape Town, South Africa Discover the breathtaking beauty of the Cape Winelands; tour a vineyard and stroll the quaint streets of Stellenbosch. alace is rated as one of the Leading Hotels of the World. er, and you will enjoy two of these thrilling adventures in the Pilanesberg National Game Reserve. This exclusive safari opportunity is one of many exciting Sun City activities, which include world-class golfing, dining and touring. Overland to Johannesburg, the vibrant and pulsing capital city, where you have a brief stop before winging to Victoria Falls – what the locals call the “Smoke that Thunders”. Delight in a guided tour of the Falls and ply the famed Zambezi River on a sunset boat cruise. Spy penguins, seals, ostriches and cavorting baboons on a full day drive to the tip of the Cape of Good Hope. Standing at the edge of the continent, perhaps you can see where the Indian and Atlantic oceans meet. Enjoy another full day of glorious scenery travelling through the Winelands: tour a vineyard, samples the wines and admire the old Cape Dutch architecture at Stellenbosch. Sheer opulence awaits at the famed Palace of the Lost City – one of the most beloved and eclectic destinations in South Africa. Indulge in a huge array of activities and sports, including a man-made wave pool! During your 3 night stay you will enjoy exciting wildlife safaris within Pilanesberg Game Reserve. Open safari vehicles venture forth in pursuit of the Big Five: elephant, lion, leopard, rhino and buffalo. Drive to the ‘big city’, stopping enroute at a popular village where locals ply their wares and tourists bargain for the perfect souvenir. Arrive at your 5 star downtown hotel, for a perfect night’s rest. Wing to Victoria Falls, Zimbabwe. Enjoy a multi-hued sunset cruise on the mighty Zambezi River, watching out for crocodile and inquisitive hippos, while sipping wine and feeling the spray from the Falls. The following day, you will explore the impressive Falls on a guided walking tour. 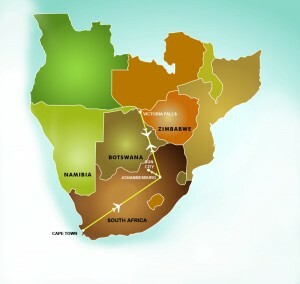 Fly back to Johannesburg and connect with your departure flight. 3 days Chobe National Park, Botswana. CHOBE GAME LODGE. Guests will explore the Chobe River and the abundant wildlife and bird species of Chobe National Park. Counter-balancing the wilderness is this restful, air conditioned, ensuite game lodge, with graceful high arches, quarry tiled floors and barrel vaulted ceilings that create an atmosphere of cool tranquility. The Chobe Game Lodge is the only permanent game lodge located within the National Park. 3 days Sabi Sand Game Reserve, Kruger Park, South Africa. SABI SABI BUSH LODGE. South Africa’s finest wildlife refuge, this is home to all the Big Five. Venture forth on morning and afternoon guided game drives, in open safari vehicles, expertly maneuvered by professional game rangers. During the quiet midday, let your five senses guide you on a thrilling walking safari! We had a wonderful trip. Everything went smoothly… The Cape Grace Hotel was great, and we enjoyed Cape Town. We had great guides on Robben Island and that was a very meaningful experience… The drive outside Cape Town, along the coast and to the wine country was truly beautiful. La Petite Ferme was great food and great vistas. Stellenbosch was really quaint and good shopping with a throwback general store that was a charmer. Dinner at La Colombe Restaurant was a really fun, delicious culinary experience. [In Botswana], we saw all the Big Five animals and more. Really quite something. Both camps were great – different and each good in their own ways. The experience with the people at Khwai River Lodge was one of the highlights. It felt like a family and we were serenaded on arrival and two other times. So all around great memories, lots of pictures, learning nature and animals and people and countries. What more could you ask! So thank you so much.